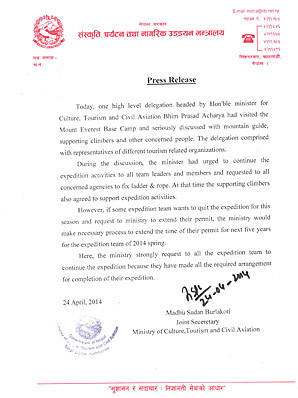 A press release sent today by the Madhu Sudan Burlakoti, Nepal’s Joint Secretary for the Ministry of Culture, Tourism and Civil Aviation states that the ministry will keep the mountain open and “strongly request to all the expedition team to continue” (see the full press release at the bottom of this story). The release, which Men’s Journal received by email from the Nepal Mountaineering Association, said a government official had been on the grounds, talked with the expedition and Sherpa leaders, and requested that supporting climbers continue with all expeditions this season. If expeditions do leave the mountain, however, the government is willing to extend permits for five years. Tensions continue to rise in the wake of last week’s tragic serac avalanche on Mount Everest, which killed 16 men, all of them professional Nepalese climbing Sherpas. The disaster underscores a three-year trend of above-average mortality rates for Sherpas on Everest, where 24 have died since the beginning of 2012. A set of demands, delivered to the Ministry of Tourism and Civil Aviation in Kathmandu on Monday, prompted a series of emergency meetings among government officials and trekking industry leaders. Meanwhile, at base camp, several expeditions have already quit, while hundreds of international guides and clients wait in limbo. For now, contradictory accounts make it impossible to predict whether the mountain will be re-opened this season. After the incident, a period of mourning was announced to allow the community to grieve, rendering the mountain effectively closed. A large number of Sherpas, particularly those with direct family roots in the Khumbu Valley, left base camp during the weekend, with the understanding they would return on Tuesday night or Wednesday. Other climbing Sherpas remained in base camp, including some of the Ice Fall Doctors (those responsible for maintaining the route through the Khumbu Ice Fall), many holding senior-level, Sirdar positions, and non-Khumbu Sherpas with no convenient place to go. In Kathmandu, the week began with a solemn funeral procession as the bodies of six of the victims were driven in open trucks through the streets of the city. Later that day the dead were cremated and a 12-point list of demands delivered to the Ministry of Tourism, which can be read here. Notable among the list, which called for 1,000,000 rupees for each of the injured and the families of the victims, or $10,590, was the demand for the creation of a mountaineering relief fund. The proposed fund, which would receive 30 percent of the money collected by the Ministry of Tourism and Civil Aviation in peak fees each year (estimated at $3.5 million for 2014), would represent a massive reallocation of resources within the Ministry. The demands also called for significant increases in the climbing Sherpas’ insurance, and a seven-day ultimatum to agree or face a general boycott of the mountain. The Ministry of Tourism announced a task force with various “stakeholders,” including representatives from the Nepali Mountaineering Association, the Trekking Agency of Nepal, and the Expedition Organizer’s Association. They promised to present a report the next day. Meanwhile, a statement from the Ministry announced that Sherpa insurance rates would be raised to approximately $16,000 in life insurance and $4,000 in coverage for injuries, and that a relief fund receiving an unspecified percentage of peak royalties would be established. Simultaneously, at Everest Base Camp, a solemn memorial and Puja ceremony honoring the victims of Friday’s serac avalanche began 10 AM. Several of the mountain’s most well-known and respected leaders spoke, including David Hahn, Russell Brice, and David Breashears. As the loosely organized event continued, however, a contingent of young climbing Sherpa began to agitate. According to eye-witnesses, the group read the list of demands that had been issued to the government, presented a petition, and announced that they were closing the mountain for the rest of the season. Others note that much of the Sherpa workforce was absent from base camp as of Tuesday night, and still expected to return from their leave of absence sometime on Wednesday. For those international climbers who remain in base camp hopeful of a resolution and eager to climb, whether or not Everest remains open this year may depend on how many of these climbing Sherpas come back. Many are ethnic Sherpas from the Khumbu Valley – guys who are typically more experienced, better paid, and generally enjoy more favorable work conditions with the larger, Western tour operators. Their valley was also the hardest hit by the recent tragedy. Those who continue to harbor summit dreams are keenly aware that, with each passing day of inactivity on the mountain, the window to effectively acclimatize and prepare for a summit bid is gradually closing. There’s also another significant problem: Any effort to re-open the mountain will first require the Ice Fall Doctors to re-establish a route through the avalanche zone – an area where several of the victims still lie. For many of the climbing Sherpa, the thought of carrying loads over the bodies of their friends may be too much, and there is some speculation that the Ice Fall Doctors will unilaterally close the mountain for good this season by removing the rest of the passage through the ice fall. As Wednesday morning arrives in Nepal, the situation remains fraught with uncertainty. The contradictory nature of much of the news coming from Kathmandu and base camp is likely a reflection of internal factions and competing interests within the climbing Sherpa community, and the larger trekking industry of Nepal. Several distinct groups of “Sherpa” actors appear to be involved in the ongoing events: the representatives of official industry associations negotiating with the government in Kathmandu, a group of politicized young men at base camp agitating for an active boycott of the mountain, the Icefall Doctors and Sirdars working to negotiate at base camp behind the scenes, and a largely still unaccounted for number of climbing Sherpas who may, or may not, return. The law of averages suggests that even if large numbers of climbing Sherpas and foreign climbers are ready to quit, left alone in an unregulated, free-market environment, a few from both sides would surely be willing to still give Everest a shot. How far those seeking an active boycott of the mountain are willing to go in using intimidation tactics and force to stop anyone from going on the mountain will shape the narrative throughout the rest of the week.